IBM® Rational® Developer for System z® speeds the development of traditional mainframe, Web, and composite applications and accelerates the development of your Web applications, traditional COBOL and PL/I applications, Web services, and XML-based interfaces. IBM WebSphere® Developer for System z was renamed to IBM Rational Developer for System z. Rational Developer for System z helps improve the productivity of developers creating and maintaining mainframe applications and Web services before, during, and after the transition to a SOA-based environment, as well as facilitating shorter development cycles that help reduce costs by extracting value from existing applications through reuse and transformation, making them accessible as Web services. Rational Developer for System z helps to simplify the overall service-flow development process with enterprise service tools and enables developers to rapidly create well-built composite processing that integrates transactional and WebSphere–based environments. This book has two parts. 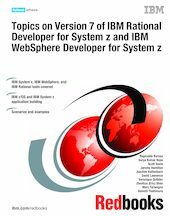 Part 1 covers Rational Developer for System z and Part 2 covers WebSphere Developer for System z.